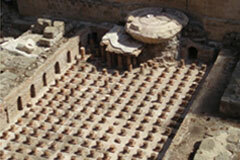 The "Roman Baths" is a landscaped public space that lies on the eastern slope of the Serail Hill. It consists of a garden and a set of uncovered ruins of ancient Roman baths, hence the name of the place. Originally discovered in 1968-69, the ruins underwent a thorough cleaning and further excavation in 1995-1997. 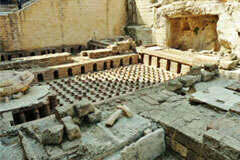 These baths dating back to the 1st century AD were found between 1968 and 1969. The site was renovated and staged between 1995 and 1997 into its current form. The marble pool, sudatorium serving as a sauna. A large stone basin (labrum) contained cool water for the bathers' use. The main room, commonly called hot room or caldarium occupies the central part of the site. The clay piers supported a marble slab, part of which is still visible, a heating system (hypocaust) under the floor allowed the air, warmed by wood fires in adjacent vaults, to circulate between pillars of terracotta disks heating the marble floor. The tepidarium or warm room, adjoining room organized in the same way. Another room still uncovered in the basement at the end of the garden site.